No photos allowed in the museum, so unfortunately, this is my only one! 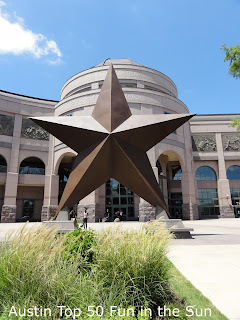 The Bullock Texas State History Museum is one of Austin's newest museum; entirely devoted to providing information about the formation of Texas as both a country and a state. This museum has three floors (focused on Land, Identity and Opportunity) with a variety of interesting displays about the native Indians, discovering oil, fight for independence and more. My boys' favorite displays are the ones that include firearms. ;o) There are many free movies to view throughout the museum, including one about the making of cowboy movies about Texas that we all enjoyed. However, my favorite is the re-creation of a historic Texas 'dog run' home. On a personal note, I have often found that the simple process of keeping my house clean and straight takes an overwhelmingly amount of time. And I wonder, how have so many people accomplished this simple feat for hundreds of years that now overwhelms me?? And every time I visit the museum, this display reminds me that our current homes are 3 and 4 times the size of homes from previous centuries. And the number of possessions we own outnumber previous owners probably by 100! Seriously, this museum provides perspective! 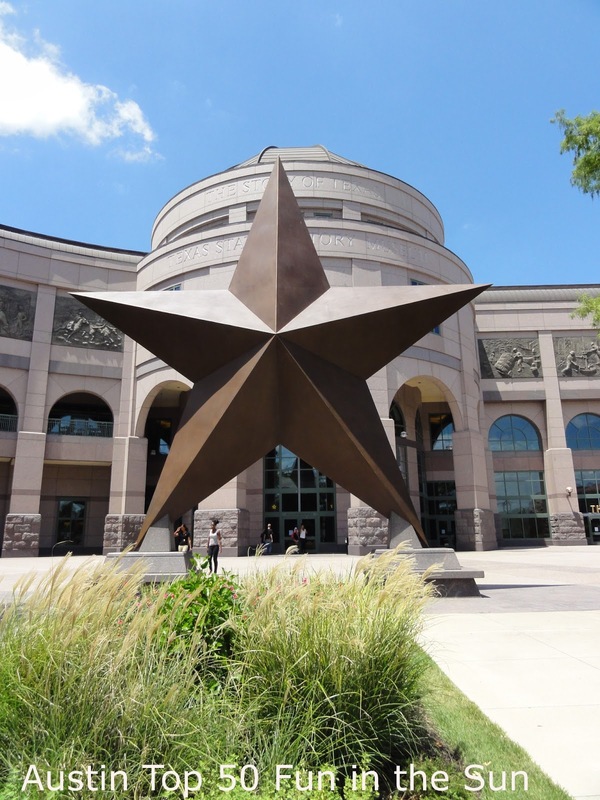 The museum also offers a couple of add-on options, including the Texas Spirit Museum and the IMAX theater. The Texas Spirit Museum offers two shows: The Star of Destiny and Wild Texas Weather. This theater is considered 4D, and incredibly entertaining. The seats rumble along with the narration, lightening strikes and there is even a fine mist to go along with the show. Over the years, we have seen both shows a couple of times and they are very fun and well worth the extra ticket price - though I'd pick one per trip - two in a visit would be a bit much :o) I would not recommend this theater for very young children (some loud sounds), but all others should find it a treat. The IMAX generally offers an educational 3D movie to enjoy. On our most recent visit, they had an absolutely wonderful movie about butterflies. I believe we've also watched one on the underwater world in the past. These movies are generally very well done, entertaining and educating, and I would recommend including them when purchasing tickets! * On the third Saturday of every month between 2pm and 6pm, the museum offers free admission to the exhibits (the movies are an additional cost), so if you are looking to save some $$$, check it out! * Plan for around a 3 hour visit. Of the many times we have visited, the exhibits take us probably an hour or two to go through - longer if you take the time to watch some of the video movies. If you check out the IMAX and Texas Spirit Theater, add another hour. * There is no food or cafeteria available in the museum. Directly across the street (north toward the Capitol) is a building that has picnic benches to enjoy if you pack a lunch. In October the Museum went through a rebranding and dropped “Bob” from our name. The full, correct name of the Museum is “Bullock Texas State History Museum.” If you could please make this correction on your website I would greatly appreciate it. Thanks.